MJCCA Day Camps is fully inclusive and strives to provide the opportunity for children with special needs to participate in our camp programs. Being in the Inclusion program at the MJCCA offers a beneficial support for your child’s summer. Whether it be a 1:1 facilitation experience, or simply support and accommodations from our inclusion director, we are here to make your child feel comfortable and able to enjoy their camp experience. The inclusion director will work with families and evaluate a child’s current placement to best determine if a facilitator is needed. Facilitated spaces are limited and are only available on a first-come first-served basis. This year, there will be a cap on the number of facilitated camp spots available each week to ensure we are providing the most successful camp experience to our inclusion campers, every day. Spaces will fill quickly, so be sure to secure your child’s spot when registration opens in January. 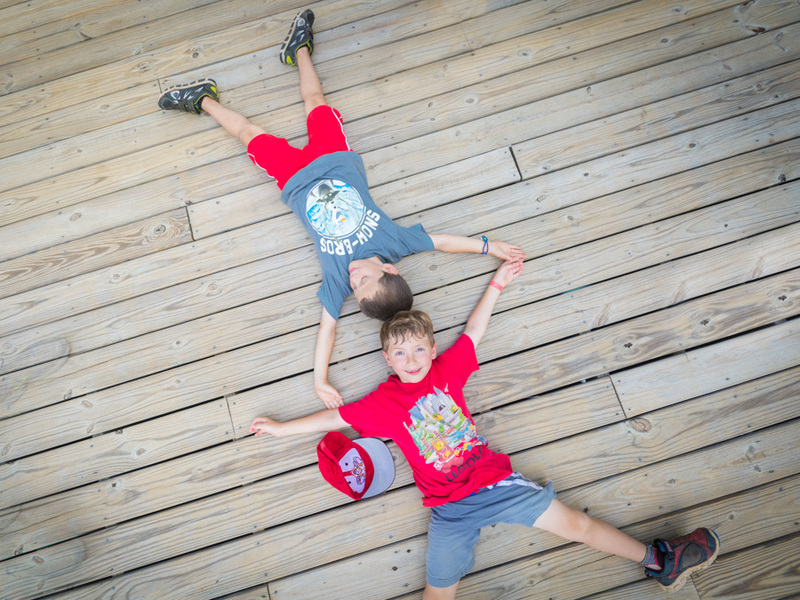 In addition, while we don’t require campers in the Inclusion program to attend for a specific number of weeks, we strongly recommend that campers attend for at least three consecutive weeks. We believe this timeframe provides the best opportunity for a camper’s success. For new campers, an intake process must be completed in order to ensure that the camp experience is a success. If you are new to camp and feel that your child will need facilitation, please contact us ahead of time so we can start the intake process. We would especially like to thank Miracle Makers Foundation, the Jewish Federation of Greater Atlanta, and Helen Marie Stern, of blessed memory. The below FAQs will provide further information. And please know that we offer Inclusion programming across all our enriching MJCCA programs, including dance, gymnastics, Club J, tennis, basketball, soccer, drama, and others. For any further questions about the Inclusion Program, please email inclusion.camp@atlantajcc.org. Q: What is Inclusion in a day camp setting? A: Inclusion provides the opportunity for children with special needs to attend camp with their typically developing peers. ALL of the MJCCA Day Camp options are part of the Inclusion Program, however, camp staff works closely with families to ensure the camps chosen will be a good fit. The MJCCA’s mission is to provide a safe and fun camp experience. We are NOT a therapeutic program and are not equipped to provide therapy, track behaviors, or collect data. Q: Is this a good fit for my child? A: Our goal is to include all campers. In order to best assess if a child is a good fit for our program, we ask families to participate in an intake process. If a child is aggressive, a threat to themselves or others, or, even with extra support from our staff, cannot participate in our program safely, MJCCA Day Camps may not be a good fit for them. Q: What if my child needs support? A: Many campers benefit from additional support in order to have the most successful experience. Our Inclusion Director will work with you to determine if a facilitator will be beneficial and available for your child. We do not assume that all children with special needs require a facilitator. If it is determined that your child will benefit from additional staff support, the level of support will be specifically catered to the needs of your child. Our goal is to fully integrate your child into the camp program. We observe each child in the Inclusion Program throughout the summer and communicate with counselors and parents to help ensure success and make modifications when needed. Parents will incur an additional fee per week for the facilitator, for one-on-one facilitation. Q: Who are the facilitators? A: While our facilitators are specifically hired to work with children with special needs, they are not therapists. Ideally, they are college students studying special education, OT, PT, or a related field. Additional training is provided and required for all facilitators. Like all MJCCA Day Camps staff, they will participate in an application, interview, and background check process. Q: Can my child attend Before-Camp or After-Camp Care? A: Yes, your child is welcome to attend before and/or after camp care. However, we ask you to keep in mind that the camp day is long and will provide many different demands of your child. We need to ensure that participation in any extended day program is appropriate. We can arrange for an inclusion counselor to attend before/after camp care with you child for a nominal additional fee. Q: Can my child ride the camp bus? A: Yes, your child is welcome to ride the bus. Many Inclusion campers ride the bus to and from camp each day. Although we do have a good number of staff on each bus, we cannot guarantee a facilitator will be on your child’s bus route. Specific accommodations for the bus can be discussed with the Inclusion Director. Q: What if my child has behavior issues at camp? A: We will work with you and your child to be as proactive as possible through program accommodations, positive behavioral management strategies, and redirection. Behavior challenges will be documented and shared with the parent. If your child exhibits aggressive behavior that is harmful to staff, other campers, or themselves, your child may need to be picked up immediately, suspended, or terminated from the program. We will work with a child as much as possible to ensure a successful experience. A: Yes, it a requirement for children attending our camp to be potty trained. Our facilitators are not allowed to change a child. If your child is not potty trained, they may attend camp with a facilitator you provide, who is comfortable changing them if needed. A: If you have any questions or would like to discuss your child before registering please contact Sarah Scheuer, our Inclusion Program Director, at 678.812.3886 or sarah.scheuer@atlantajcc.org. Otherwise, you can proceed with registration. When registering there is a place to indicate that you are interested in the Inclusion Program. You will then be contacted to begin the camp inclusion intake process.